Ron Paul put sound money issues on the national radar screen during his presidential campaigns in 2008 and 2012. His push to Audit the Fed introduced Americans to the sordid origins of our central bank. For the first time, large numbers of people began questioning the benevolence and wisdom of an institution, wholly owned by the nation’s largest banks, with total discretion to do whatever it wants in near total secrecy. Ron Paul’s son Rand is not generating nearly as much enthusiasm as his father did. However, the issue of sound money is far from dead. Some of the Republican candidates for president are at least paying lip service to ideas such as reforming the Federal Reserve and even returning to the discipline of a gold standard. Rand Paul told the nation that he thinks “price controls” when it comes to the most important price of all -- the price of money, namely interest rates -- is a terrible idea. Critics will point out that Cruz and Paul are both way behind in the polls. But Cruz is making some headway, climbing into third place following the debate. And they aren’t the only candidates talking about honest money. It remains to be seen if candidates will be as willing, or as effective, as Ron Paul when it comes to questioning the status quo. The potential for someone to make some political hay is certainly there. Much of what the Fed has done in recent years on behalf of its bank masters, and at the expense of the U.S. economy as a whole, is downright scandalous. For starters, we think Americans would be keenly interested in why the Fed bought more than $1.7 trillion in mortgage securities – many of which officials knew to be loaded with completely worthless, fraudulent loans – and paid the banks huge premiums above the market price to get them. As a primer, we suggest candidates watch this informative video from John Titus with BestEvidence. Then they should ask our esteemed central bankers to explain themselves. Regardless of whether the issue of sound money sways the 2016 presidential election, its day in the spotlight is coming. As expected, Congress threw in the towel once again and agreed on a two-year deal to suspend their self-imposed and perpetually ignored borrowing limit. Without the discipline of a gold standard, growth in federal spending and debt shall continue unimpeded. Eventually this sort of reckless and irresponsible behavior ends in a crisis of confidence and potentially, the collapse of the U.S. dollar. It is only a question of whether politicians will get serious about sound money before, or after, that happens. 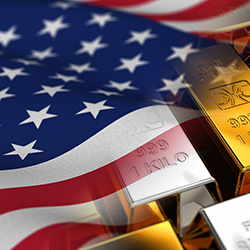 Clint Siegner is a Director at Money Metals Exchange, the nation's largest and fastest-growing dealer in low-premium precious metals coins, rounds and bars. Siegner, a graduate of Linfield College in Oregon, puts his experience in business management along with his passion for personal liberty, limited government, and honest money into the development of Money Metals' brand and reach. This includes writing extensively on the bullion markets and their intersection with policy and world affairs.